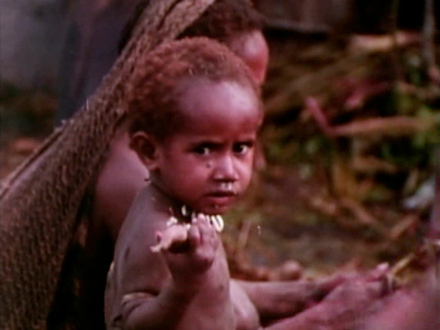 Dead Birds is a film about the Dani, a people dwelling in the Grand Valley of the Baliem high in the mountains of West Irian. When I shot the film in 1961, the Dani had an almost classic Neolithic culture. They were exceptional in the way they focussed their energies and based their values on an elaborate system of intertribal warfare and revenge. 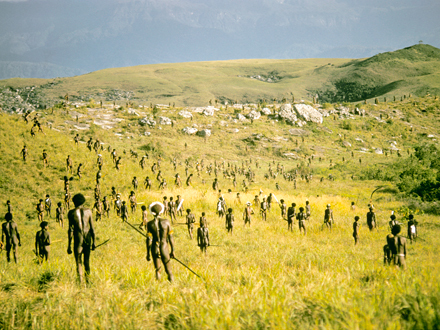 Neighboring groups of Dani clans, separated by uncultivated strips of no man's land, engaged in frequent formal battles. When a warrior was killed in battle or died from a wound and even when a woman or a child lost their life in an enemy raid, the victors celebrated and the victims mourned. Because each death had to be avenged, the balance was continually being adjusted with the spirits of the aggrieved lifted and the ghosts of slain comrades satisfied as soon as a compensating enemy life was taken. There was no thought in the Dani world of wars ever ending, unless it rained or became dark. Without war there would be no way to satisfy the ghosts. Wars were also the best way they knew to keep a terrible harmony in a life which would be, without the strife they invented, mostly hard and dull.